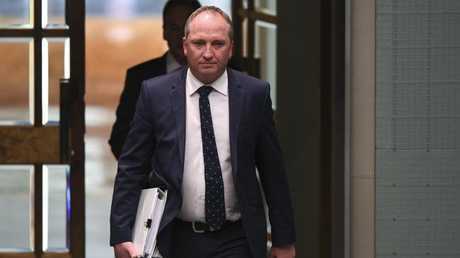 POLITICAL pressure is building to remove Barnaby Joyce as Deputy Prime Minister after reports his own party is discussing how they could get him to formally resign. Mr Joyce has been at the centre of scandal for the past week after his affair with former media adviser Vikki Campion and marriage breakdown landed him in the public spotlight. National Party MPs are now holding discussions on how to get their leader to resign and plan to "formally tap" him on the shoulder, according to ABC reports. Senior Nationals have been approached to form part of a delegation to ask him to step down, the ABC claims. Meanwhile, Veterans' Affairs Minister Michael McCormack has been named as the "overwhelming favourite" to replace Mr Joyce, according to the Herald Sun. It's believed National MPs are calling for an orderly transition to a new leader and sources close to Mr McCormack told the paper that he would only accept the job if Mr Joyce resigned. Barnaby Joyce with then media advisor and now official partner Vikki Campion at a farm summit in Sydney in 2016. It comes amid fears Mr Joyce was losing his support base in Queensland over the scandal. Former Nationals leader Warren Truss said on Tuesday night Mr Joyce continuing as leader of the Nationals was "a matter for his parliamentary colleagues". While Mr Truss believes Mr Joyce had "enormous capabilities", he said the situation needed to be resolved "constructively and quickly so that the business of government can proceed". The Deputy Prime Minister has not yet been visited by any delegation but a number of government sources are predicting he will have to resign. Once admired for his authenticity and credibility, many in the National Party feel that reputation, which earned him so many votes, is now in tatters. Nine's political editor Chris Uhlmann said despite the National Party rarely getting rid of its leaders, he "wouldn't be surprised if he was gone by the end of the week". "His future is now in the hands of the 21 very nervous National Party members," the political editor said. Earlier today, reports revealed Mr Joyce spent 50 nights in Canberra on the taxpayers' purse when Parliament wasn't sitting - more nights than any other Turnbull government minister. Fairfax Media today reported official expense records show the embattled politician claimed $16,690 in travel allowance for out-of-session nights in the first nine months of 2017. The amount exceeded that of any other top government official, including Treasurer Scott Morrison, Finance Minister Mathias Cormann and Foreign Minister Julie Bishop. Mr Joyce was acting Prime Minister for 10 of the 50 nights. He was entitled to claim $276 per night for official business as Deputy Prime Minister and $565 per night as acting Prime Minister. He also claimed for 62 sitting nights, spending a total of 112 days in Canberra out of 272 days. News Corp does not suggest Mr Joyce claimed anything outside the rules that govern MPs entitlements. Mr Joyce's office said his stays in Canberra were a result of his electorate not having permanent commonwealth offices like capital cities. 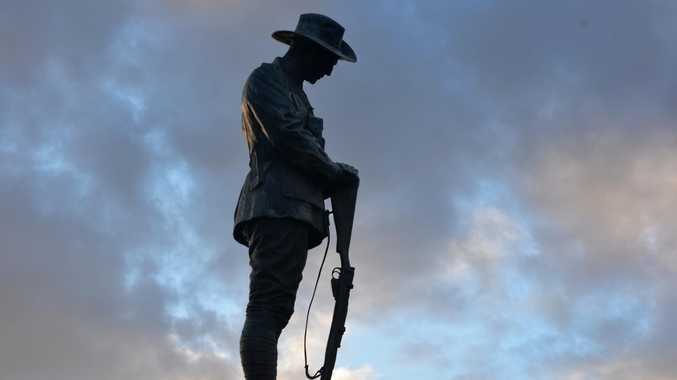 "It should be expected that the Deputy Prime Minister would use the Canberra Office more frequently than those Ministers who have capital city bases," a spokesperson told Fairfax. Malcolm Turnbull was today drawn into the saga again when asked by the Parliament this question: when does a lover become a partner? The matter is critical because if the Deputy Prime Minister's new partner, pregnant former staffer Vikki Campion, was his de facto, her movement among offices would have breached ministerial guidelines barring jobs for relatives. But if she had the status of friend or lover, the moves were acceptable. The Prime Minister attempted to clarify the matter, acknowledging those ministerial standards did not provide a definition. "But the standard definition, for example the Department of Human Services, says a partner is considered to be a partner if you and the person are together or usually live together and are married or in a registered relationship or a de facto relationship," he said. "Centrelink considers a person to be in a de facto relationship from the time they commence living as another person as a member of a couple." And he was confident that even under that definition, Ms Campion's transfers had not contravened standards. Labor had earlier reminded Mr Turnbull that Ms Campion had moved from Mr Joyce's office, to the office of Resources Minister Matt Canavan, back to Mr Joyce's office, and then to the office of the National Party Whip Damian Drum. The Prime Minister appeared to back away from a defence of those movements issued by his office yesterday. A spokesman for the PM had told AAP Mr Joyce had not breached ministerial standards in regard to the employment of family and partners because Ms Campion was not his "partner" at the time of her appointments. "Those statements … followed a background discussion and were not authorised by me," Mr Turnbull said. "As the Deputy PM confirmed in his statement of Saturday, February 10, and again in his statement this morning, the Nationals are responsible for decisions relating to staffing in the office of Nationals' members," he told Parliament. "He confirmed that the PM's Office has an administrative role in informing the Department of Finance of changes." A DEFIANT Mr Joyce this morning told a "robust" meeting of Government MPs he was not going to quit. The Deputy Prime Minister said: "Everyone in politics goes through a time of trial. This is mine, but I'll emerge from it." His insistence came amid reports Mr Turnbull was canvassing Nationals backbenchers to test the standing of their leader. Mr Joyce made clear he was determined to resist pressure from within his party and elsewhere to resign over his matrimonial tangle and implications related to use of taxpayer money. The Deputy PM confirmed that former staffer Ms Campion, who is carrying his fifth child following the breakdown of his 24-year marriage to wife Natalie last year, is his new partner. But the embattled Nationals leader insisted she was not his partner when she worked in his office. "I would like to say to Natalie how deeply sorry I am for all the hurt this has caused," he said. "To my girls, how deeply sorry I am for all the hurt it has caused them. To Vikki Campion, how deeply sorry I am that she has been dragged into this. "I would like to also say to my supporters, and the people in my electorate how deeply sorry I am that this personal issue has gone into the public arena. "It is without a shadow of a doubt that Vikki Campion is my partner now. "But when she worked in my office, she was not my partner. When she worked in Matt Canavan's office, she was not my partner, and Damian Drum (who also employed Ms Campion) was not a minister. "I think it is vitally important in how we differentiate between the public and the private." He also denied new claims of inappropriate behaviour. In a written statement following his comments, Mr Joyce added: "This has been a searing personal experience for Natalie, our daughters and for Vikki - criticise me if you wish but please have some regard for them." Mr Joyce insists his circumstances are personal and do not have public interest implications. But one of his Queensland colleagues today asked for an explanation as to how Ms Campion was moved between offices. Liberal National Party back bencher Ken O'Dowd told Gladstone radio 4CC he might stand for the leadership if there is a vacancy, warning: "It's going to open." "I'm not predicting that anything's going to happen today but if it does, there's going to be a lot of guys with their hands up, and I might just be one of those," said Mr O'Dowd. He said that while Mr Joyce had a private life - "and I'm prepared to sort of say, well that's OK, that's your life, you lead it the way you want" - there were public matters attached. Mr O'Dowd said Mr Joyce would need to explain "this transfer of staff from one office to another office and how that came about." "You know that's what's got to be explained today, and that's what's got under people skin you know, especially when some of these staffers are on very high paid salaries," he said. Former Labor senator Sam Dastyari is also determined Mr Joyce is on his way out, saying "Barnaby Joyce is done". "Barnaby's just lost control ... the stories that are coming out. The rumours that are out there about Barnaby are so much worse. They get way worse than that," Mr Dastyari told KIIS 106.5's Kyle & Jackie O. "The bloke is done. Whether it's today, next week or the week after. He's done." Former Nationals minister Darren Chester, dumped by Mr Joyce in December, today said the Nationals party meeting yesterday had been robust but there had been no talk of leadership change. "There was a robust discussion about the situation that developed over the past week or so and Barnaby made an apology to the room about the discomfort he'd caused," Mr Chester told Sky News. "He was remorseful of the fact that his private life, very personal aspects of his private life, had become so public." Mr Chester said the "wideranging" meeting became "a business-as-usual meeting". "There was no discussion about changing the leadership," he said. 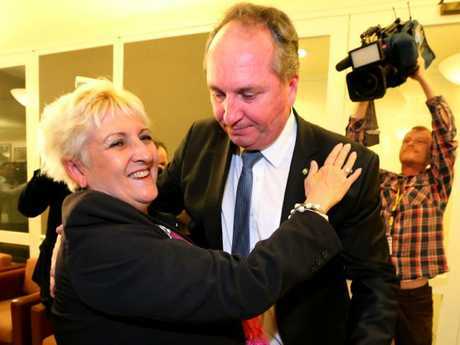 Barnaby Joyce congratulates Michelle Landry on winning the seat of Capricornia. Mr Joyce revealed his marriage to Natalie broke down last year after being under pressure for some time, and said he took responsibility for the failure without detailing causes. The breakup came at around the same time his former staffer Ms Campion moved to the office of another Nationals minister. Mr Joyce didn't link Ms Campion, who is expecting his child in April, to the breakdown, but referred to their friendship in a written statement. "My marriage was under pressure for some time, Natalie and I tried to make it work again in April last year but it subsequently came to an end. I take responsibility for that failure." he said. "Vikki Campion has also been the subject of unwanted and deeply hurtful commentary at a difficult time, particularly as we are having a child together in mid-April." He said Ms Campion joined his staff for the July, 2016 election in New England. In August she joined his ministerial staff. "A friendship subsequently developed and that became, over time, more," he added. Mr Joyce repeated his argument that her move to Mr Canavan's office and then to Mr Drum's office had not breached rules banning the employment of partners. "She was well qualified for the role, was an existing and obviously capable staff member and the change was within the existing Nationals staff arrangement," he said. "I did not discuss these matters with the Prime Minister or his office as Vikki was not my partner, so they were dealt with in the usual course of staff deployments within the Party. 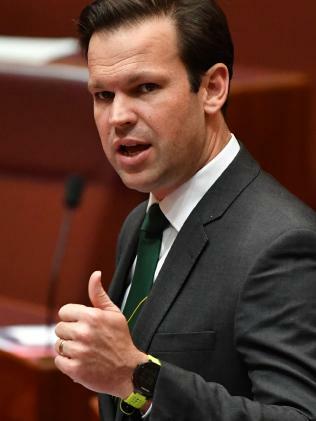 "When Mr Canavan stood down over the citizenship issue she went to work for another MP and subsequently left the Nationals staff following the most recent reshuffle." His comments came in response to questions around how she left Mr Joyce's office to work with Nationals colleague Senator Canavan and then with the party's whip, Mr Drum. Mr Joyce also denied allegations he "pinched a woman's bottom", responding to Daily Telegraph's reports an unidentified woman said she saw Mr Joyce after the Rural Women's Agricultural Awards in Canberra when he was in Opposition. The woman claimed she went to speak to him about his conduct, saying: "I went over to the bar and he was very, very drunk and nearly falling over. 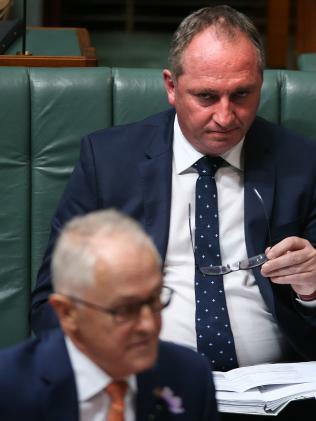 "I said, 'Barnaby, I think you should go home. You're very drunk.' He leant over and he pinched my bottom." Addressing media outside Parliament this morning, a furious Mr Joyce said the incident "did not happen". "This is a story that has been brought about by a person unnamed, at a venue unnamed, at a time unnamed, seven years ago, and has been pedalled by the bitterest of political enemies to me," he said. "It is not something that I'm aware of ... it's just in the past." Mr Joyce had already denied the "bum pinching" allegations, with a spokesman saying he did not go a pub or nightclub after the event. However, the claim was backed by John Clements, a former staff member for Joyce's political rival Tony Windsor, who warned Mr Turnbull's senior adviser, Sally Cray, about the alleged incident in December 2015 in an "off record" text message exchange. While Ms Cray noted the allegations sounded "inappropriate", there was no official complaint or evidence Mr Joyce had done anything wrong so the matter was dropped. Mr Clements confirmed to The Daily Telegraph he approached Mr Joyce after the woman appeared "rattled". "I've never seen her rattled and she said she had been pinched on the bum and she pointed at the man. It was Barnaby Joyce. I approached Joyce and asked him what he thought he was doing," he said. The news follows a nightmare week for the Deputy Prime Minister which saw the relationship revealed along with news of the expected baby in April, and newly-created government roles handed to Ms Campion after she left Mr Joyce's office. The Prime Minister yesterday said no favours or rules were breached when Ms Campion changed jobs. Senior Nationals senator Nigel Scullion said the party tried to keep skilled staff employed when something happened to an MP. "We make sure we look after our staff," Senator Scullion told Sky News. "My understanding is that Barnaby or Vikki Campion have absolutely nothing to answer for, although they appear to be paying the penalty pretty heavily no matter whether they've done anything or not." Ms Campion left Mr Canavan's office when he was caught up the citizenship saga to become a senior adviser for Mr Drum, reportedly on a $190,000-a-year salary. Mr Turnbull said the Nationals were given a specific number of personal staff positions as a share of the government's overall staffing pool. "The distribution of those staff members between Nationals offices is a matter for the National Party," Mr Turnbull told parliament. "At no time did the Nationals fill all vacant staffing positions." The ABC reports that Mr Joyce has not yet taken formal steps to declare his former media adviser is now his partner despite the pair living together with a baby due in April. He has reportedly updated the formal register of interests to declare his split form his wife but not his new relationship. Mr Turnbull confirmed Mr Joyce would be Acting Prime Minister while he was in Washington next week for talks with US President Donald Trump. When asked if he had confidence in Mr Joyce, Mr Turnbull answered: "Yes." Asked if Mr Joyce was an appropriate acting prime minister choice, Treasurer Scott Morrison said: "Of course he is." He told the ABC: "While events regarding Barnaby's private life, I'm sure are disappointing ... most importantly to his family and others, that doesn't change the fact that Barnaby, over a long period of time in his public life, has dedicated himself to public service and the people he represents."